Published: April 21, 2015 at 07:43 p.m.
Can the defending Super Bowl champion Patriots continue their success in 2015? Find out with these mind-blowing stats for the 2015 schedule release. The correlation between strength of schedule and teams making the playoffs has been extreme in the last five seasons. Teams with a Top 5 toughest strength of schedule in that span have made the playoffs 24.1 percent of the time. Teams with a Top 5 easiest strength of schedule have more than doubled that percentage, making the playoffs 50.0 percent of the time. In 2015, that’s good news for the Falcons, Colts, Texans, Buccaneers and Saints -- who have the league’s easiest schedules. It’s bad news for the Steelers, Bengals, 49ers, Seahawks, and Cardinals – the owners of the toughest 2015 schedules. As they try to defend their Super Bowl title, the Patriots will play only 4 games against teams that made the playoffs last season, tied for the fewest such total in the NFL (with 9 other teams). Those four teams are the Colts, Broncos, Cowboys, and Steelers – a group against whom the Patriots went undefeated last season (2-0 vs IND, 1-0 vs DEN, did not face DAL or PIT). Some might consider a move to snowy Buffalo a cause for concern, but not LeSean McCoy. McCoy has played one career game in the snow: Week 14, 2013 against the Lions. In that game, he posted a career-high 217 rushing yards and scored 2 rushing touchdowns as his Eagles won 34-20. In 10 career games played under 40 degrees, McCoy has averaged 5.1 yards per carry, the third-highest total among all players with 100 such rushes since 2009. When Andre Johnson faces his former Texans team in Week 5, he will become the 8th player in NFL history to square off against a team for which he registered 10,000 receiving yards. The previous seven: Jerry Rice vs the 49ers (as a member of both the Raiders and Seahawks), Cris Carter vs the Vikings (as a member of the Dolphins), Tim Brown vs the Raiders (as a member of the Buccaneers), Isaac Bruce vs the Rams (as a member of the 49ers), Torry Holt vs the Rams (as a member of the Jaguars), Tony Gonzalez vs the Chiefs (as a member of the Falcons), and Steve Smith Sr. vs the Panthers (as a member of the Ravens). Those seven players averaged 63.3 receiving yards per game in their first contest against their former team, with two of them topping 100 yards: Torry Holt, who had 101 yards vs Rams in 2009, and Steve Smith. Sr., who had 139 yards, 2 TD vs the Panthers in 2014. The Patriots have had at least 9 wins in every one of their seasons following a Super Bowl appearance under Bill Belichick. They’ve made the playoffs in 3 of 5 such seasons. When DeMarco Murray faces his former team in Week 2, he will become the first player since Bill Dudley in 1947 to lead the league in rushing and then face the team with which he led the league the very next season. In his very first game of the 1947 season, Dudley’s Lions faced his former squad, the Steelers, with Dudley catching a TD pass in a 17-10 loss. At least Murray won’t have to face the Eagles any longer, against whom he has averaged only 3.0 yards per carry in the Chip Kelly era. Five teams will play over half of their 2015 games against teams that made the playoffs last season: the Steelers, 49ers, Seahawks, Rams, and Browns. 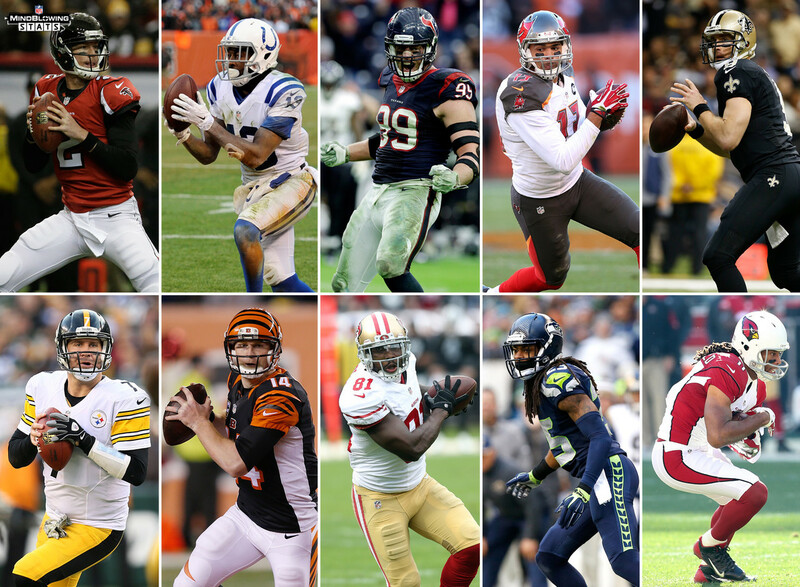 How did each of those teams do against playoff opponents in 2014? The Steelers and Seahawks each went 5-1 against playoff teams, tied for the best such record in the NFL. The 49ers, Rams, and Browns didn’t fare quite as well, going a combined 6-14 against playoff teams (SF 2-4, STL 2-4, CLE 2-6). With the return of Darrelle Revis and Antonio Cromartie to the Jets, Tom Brady will face two of his biggest foes twice per season. Revis and Cromartie are 2 of 3 active defensive backs against whom Brady has a passer rating below 70 despite 30+ targets in coverage (including playoffs). The third player? A former Jet, 2010 first round pick Kyle Wilson. The Steelers will face the NFL’s toughest schedule this season based on the 2014 record of their upcoming opponents (147-107-2, a winning percentage of .578). If last season’s performance is any indication, a tough schedule won’t be an issue. Pittsburgh went 6-1 against teams to finish the 2014 season with a winning record, the best mark against winning teams in the NFL. The Falcons will face the NFL’s easiest schedule this season based on the 2014 record of their upcoming opponents (104-150-2, a winning percentage of .410). Atlanta went 5-5 against teams to finish the 2014 season with a losing record, and 1-5 against teams that finished with a winning record.